If you are like me, nothing quite says summer like watermelon. The days get longer. It’s time for bare feet, shorts and sunshine. And when you head to the store, there is the most enormous box of whole watermelons that you’ve ever seen and then you know… you know… summer is truly here. There’s something wonderful about that first taste of juicy sweetness–you know the kind I mean, that big mouthful that makes you feel like maybe you took too big a bite because suddenly you feel like you’re a kid again and that watermelon juice just might trickle right down your chin! It’s sweet. It’s delicious and oh my goodness, it is summer! 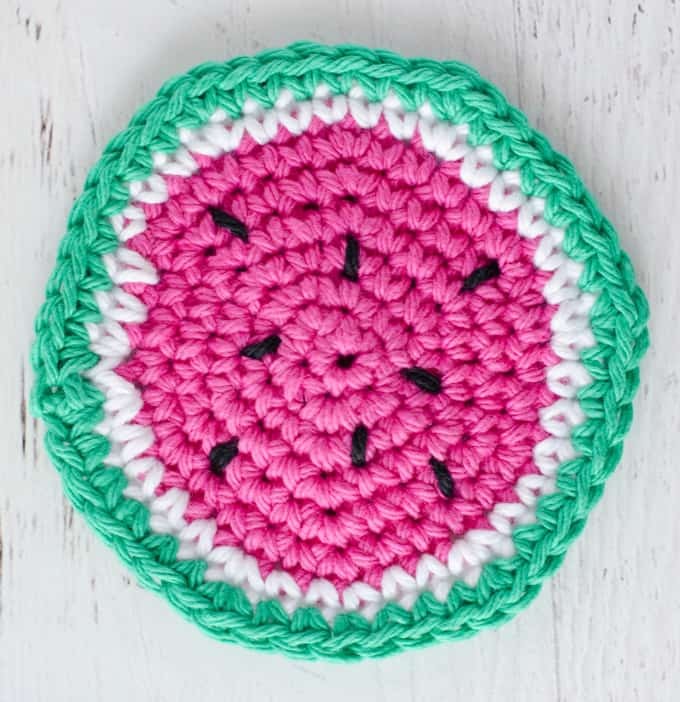 If you liked my citrus coasters, you might just like what I’ve got for you today.. crochet watermelon coasters! I like my coasters in single crochet cotton. I think it makes them really absorbent (because who wants that icy glass to get water all over your tables). I think it would be adorable to crochet a coaster box in matching colors too–and you can head right over here to snag that pattern. You might want to make it for a gift. Myself… I decided to make these for me and they make me happy just looking at them! Finished coasters are about 4-1/4″ in diameter. R1: 6 sc into 2nd st from hook (6 sts). Work in rounds. R8: Attach green with a standing sc working as follows: *sc in next 6 st, 2 sc in next st, repeat from * around. Attach with slip stitch to starting (48 st). Fasten off and weave in ends. With black yarn, make small stitches to represent seeds in the pink section. Ta Da! 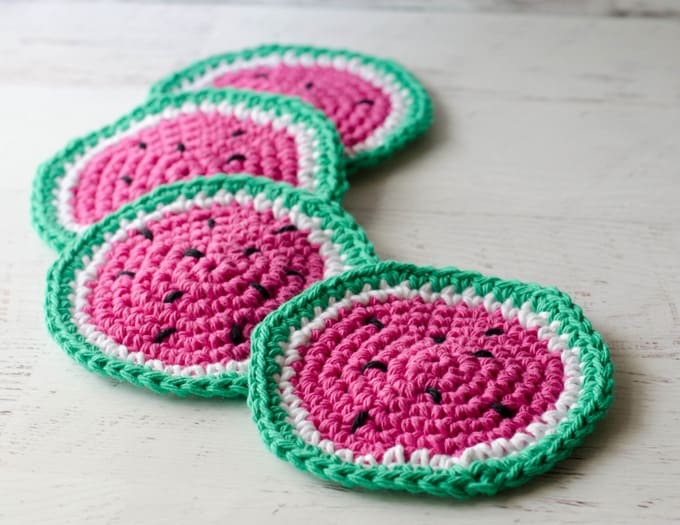 Crochet watermelon coasters! I love seeing your finished projects! 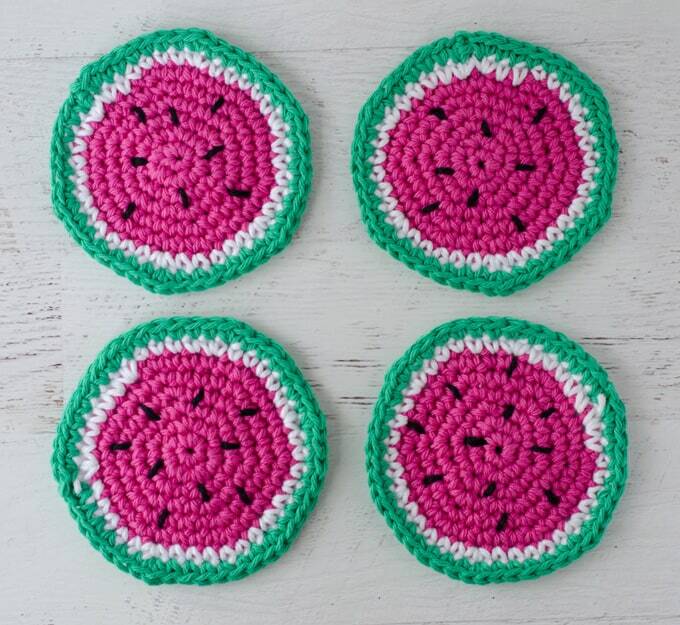 If you share your Crochet Watermelon Coasters on Instagram, be sure to tag me @crochet365knittoo. If you are on Facebook, stop over to the Crochet 365 Knit Too Facebook page and share a photo! I’d love to see your work! Written pattern copyright Cheryl Bennett 2018, all rights reserved. Please do not reprint or repost this pattern. 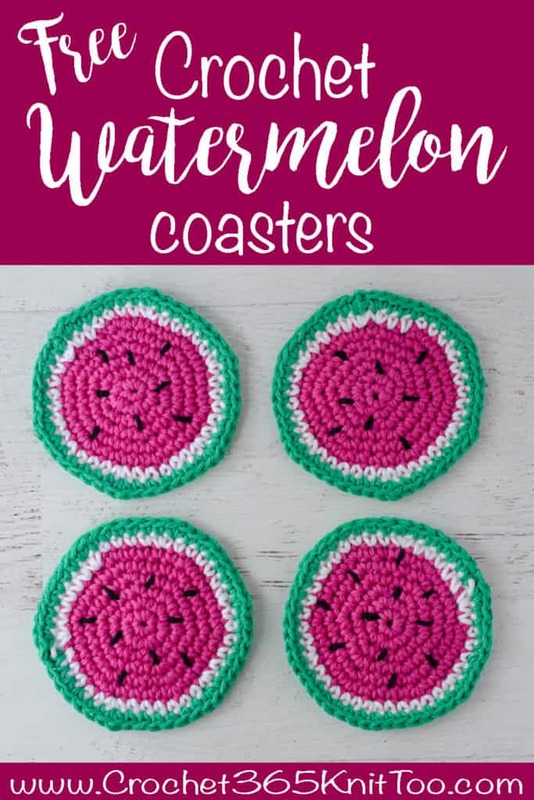 If you would like to share this Crochet Watermelon Coasters pattern with others, just link to this page. If you’d like to make items for sale from this pattern, please visit my About page for more information.